Free yourself from cylinder and-or liquid oxygen deliveries! Oxygen concentrators, often called "oxygen generators," provide an affordable and hassle-free alternative to cylinder service. Widely known for reliability and quiet operation, oxygen concentrators filter your surrounding air through a system that provides a steady supply of fresh, free oxygen 24-hours a day, 7-days a week. 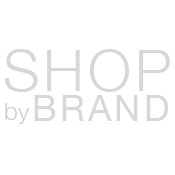 Oxygen concentrators simply plug into your existing home wall socket. Oxygen Concentrator System models generally have wheels on the bottom that make them easy to move from room-to-room. 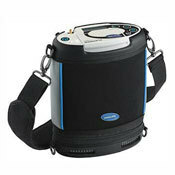 While Portable Oxygen Concentrators are much lighter weighing as little as 4 lbs., can be conveniently carried around with provided carrying case, feature a rechargeable battery, and can be powered in the car or airplane with a handy AC adapter for users truly on-the-go. Some oxygen concentrator systems also offer convenient Home Fill adapters that allow you to fill smaller ML6 or ML9 cylinders that can provide as much as 2 hours of portable oxygen. 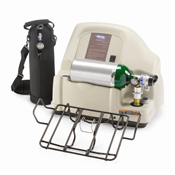 Are you currently renting an oxygen concentrator? NewLeaf customers are frequently surprised to learn that purchasing a personal oxygen concentrator often pays for itself in a short period of time compared to what they pay in insurance deductibles to rent. 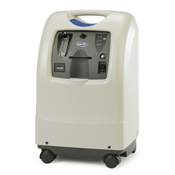 Oxygen concentrators can deliver a flow rate of 1 to 10 LPM (liters per minute) of up to 95.6% oxygen concentration. So check with your physician to see what "Flow Rate" is best for you. And give us a call at 888.739.4330 for a personal consultation with a trained advisor.